Leaping out of Earth-2 Lois Lane, the Trickster lunges to attack Earth-2 Wonder Woman; that is until she is caught in Diana's Lasso of Truth. However, instead of answering Diana's questions about why she's here, the Trickster shows a glimpse of her dark lord: Darkseid. 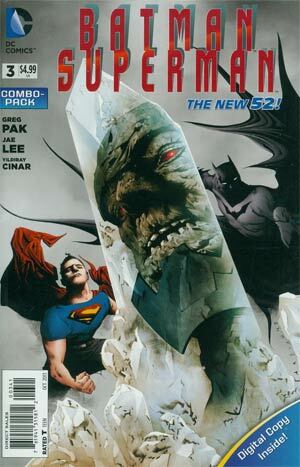 Neither Superman is aware of who Darkseid is, and he actually scares Earth-1 Clark a little bit. 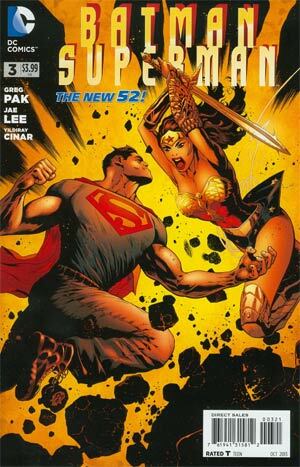 The Trickster then vanishes, but before she leaves she sends the Supermen and Wonder Woman to find Earth-2 Batman, who has a secret "weapon" called "The Shard". As he's flying to confront his best friend, Earth-2 Superman remembers his childhood when he first met Earth-2 Bruce Wayne in Smallville. Bruce and Alfred had been passing through when their car broke down. While Alfred fixed the automobile, Clark asked Bruce if he wanted to play baseball with him. Bruce accepted and they began to play, that is until Bruce showed Clark what his idea of fun was as he teaches Clark how to fight. Later that night, Bruce and Alfred joined the Kents for dinner and the two boys went outside. Bruce bashed Clark in the head with his baseball bat to prove to Clark that he was different, but that he didn't care. In the present, the Supermen and Wonder Woman fly across the country to find Batman when they see an NSA bunker that is keeping the Shard. Diana doubts Batman's intentions but Earth-2 Superman reminds her that he once asked Bruce to prepare for if he would lose control and become a villain. Just then, the Batmen attack Superman who flies to the ground. The young Superman then attacks the Batplane, bringing it to the ground. Batman and Superman then engage in battle, at least until their Earth-2 counterparts put a stop to it and ropes the two into helping them destroy the Shard. Just then the Trickster leaps out of Wonder Woman, as she had been in her the entire time, and shows them another vision of Darkseid. The story ends with the two Supermen and Batmen in front of the Shard with the Trickster telling them that one would save the world, one would die, one would destroy the Shard, and one would seize it. Story - 4: I know I kinda say it every month, but I am really enjoying Batman/Superman. It has quickly become one of my favorite Superman books, only next to Unchained, and has become one of my favorite Batman books, only next to Batman. It's definitely a must read book for those excited for the upcoming "World's Finest" film starring Henry Cavill and Ben Affleck as Superman and Batman respectively. I really liked this issue of the book because it moved the story along more past just Batmen fighting or Supermen fighting. Now granted, I do believe it was needed in the last issue (I'm speaking about the fights here), but if it were here as well, then it would have been over-kill. That being said, I did really enjoy the brief one-page skirmish between Batman and Superman. I have to say, I find it odd that the main characters of this book (at least in this issue) seem to be the Earth-2 versions of Superman and Batman. Now, I'm not complaining as I love these characters and I've wanted more of them since they perished in Earth-2 #1 (SPOILERS! 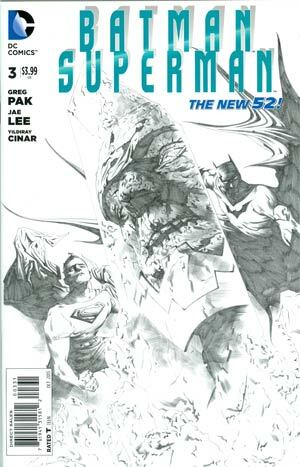 ), but it's odd that on the cover of this book it has Batman and Superman of the New 52 continuity, well, I guess this is all New 52, so New Earth continuity, when really their Earth-2 counterparts are more-so the stars this month. Again, I'm not complaining because it's still Batman and Superman, but it is a little odd. Now, I have to talk about the Earth-2 Superman flashback scene with him and Bruce as kids. First of all, for those of you who did not know, this part of the story is an alternate version of "When Clark Met Bruce: A Tale from The Days of Smallville" by Jeph Loeb and Tim Sale. For those of you who have not read that story it is included in the Superman/Batman: Public Enemies graphic novel (yes, it's also a fantastic animated film...) by Jeph Loeb, Ed McGuinness, and Dexter Vines and it is THE definitive World's Finest story (at least in my opinion). I believe the Homepage is actually having some sort of sale on Superman/Batman related products right now and that graphic novel is actually included. Believe it or not, that is actually the story that got me into seriously reading/collecting comics and it is my all-time favorite comic book story, so check it out! Anyway, shameless plugs aside, it is an alternate version of that story. See, in Post-Crisis continuity, this happened on New Earth when Pete Ross and Clark Kent were playing baseball (this still happened in Batman/Superman #3) and Clark hits it towards Bruce & Alfred's car. But unlike how it plays out in Batman/Superman #3, Clark never asks Bruce to play, therefore they are not friends until years later and that day they spent together in this issue never happened. I just want to say that I respect Greg Pak immensely now just because he put in a Jeph Loeb story into his own. But not just that, I also love that he is trying to have the same dynamic between Batman & Superman, or A Batman & Superman, that Jeph Loeb had in those first 20 or so issues of Superman/Batman, because it was something that the New 52 was sorely missing. Again, I have a lot of faith in Greg Pak now, so he needs to take over Action Comics sooner than later. I'm very interested by Darkseid's part in this story and I'm wondering if the reason he seemed to know Superman in Justice League #6 (when he specifically takes him from Earth and calls him "Kryptonian," remember?) is because of this story. Yet, clearly Batman & Superman both had their minds wiped after this adventure (wouldn't be the first time, go back to World's Finest #200 from the 70's for more) so they have no memory of seeing Darkseid or of meeting each other or their Earth-2 counterparts. Also, quick thought, is it possible that the Darkseid we see here is not only the one we see in Justice League: Origin, but is also the one we see in Earth-2? My theory is that he's searching the entire Multiverse for his daughter, and will destroy every Earth to get her back. I wonder how his invasion of Earth-3 went? Is that why the Outsider and Atomica escaped that Earth? Sorry, Justice League #23 SPOILERS! Finally, I want to talk about the end of this book. One will save the world. One will die. One will destroy the Shard. And one will seize it. I think Earth-2 Batman saves the world (see Earth-2 #1). I think either Earth-2 Superman will die (see Earth-2 #1). I think Superman will destroy the Shard, and I think Batman will seize the pieces in order to protect himself from Superman in case he went rouge. Am I on the right track guys? Anyway, I really enjoyed this issue; it was a lot of fun and gives us a lot to think about. Again, Superman and Batman have always been my all-time favorite heroes, and to the chagrin of my fellow Homepage Staff Members, I like them both equally. Regardless of my personal attachment to these characters however, I really enjoy the writing on this book, it's outstanding. I'll be back next month (Villain's Month, part of the Forever Evil story arc by Geoff Johns!) 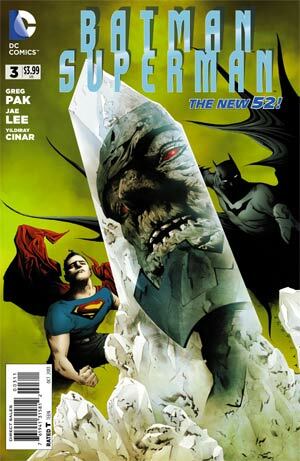 with Batman/Superman #3.1 aka Doomsday #1 where we will learn about the New 52 version of Doomsday for the first time! Last time we saw this character was in the Post-Crisis universe in Action Comics #904 (the final issue before the New 52)! I can't wait to read about how Doomsday killed Superman in this reality, his origin, and what Batman has to do with it as it is a Batman book as well. Until next time guys, cheers! Art - 3: I do like Jae Lee's cover art a lot, but his interiors to me seem a bit messy. The panel where Earth-2 Superman is getting bombed by the Batplane is a perfect example. If you look at Superman's face there, it doesn't even look human (or in this case, Kryptonian); he looks more like a ghost. That being said, he drew the Batman/Superman fight a very pages after that very well, and I loved his rendition of Darkseid. But I must say, I probably liked Cinar's art better than Lee's. Cinar drew those flashbacks fantastically and I absolutely loved them, which is why I can't give art a low score. Cover Art - 5: What can I say, I just really loved this cover art. Batman and Superman are displayed prominently and Darkseid looks great on the cover. Just a really cool cover that would make me want to pick up the issue at my local comic book story. Didn't love it as much as the first issue's cover, but I think it's #2 for sure!